Responding to critics in Jewish Home, secular candidate Ayelet Shaked says kippah wearers like MK Orlev made expulsion possible. The primaries within the Jewish Home are getting nearer, and the race has begun to get nasty. 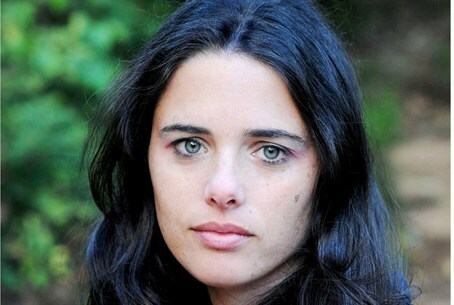 Ayelet Shaked, founder of Yisrael Sheli and a member of Naftali Bennett's team, fired back at those who say she should not represent the Jewish Home in the Knesset because she is not religious – and did so by slamming rival candidate MK Zevulun Orlev. "These people have a right to think whatever they want," she told Galei Yisrael radio, "but I am happy to note that there is a very large part of the populace that thinks otherwise. The truth is that I am saddened somewhat by their opinion. I think that we are one nation, with one destiny, we have a very large common denominator, and there is no need for emphasizing what makes us different, for separatism." Then she added the zinger: "Zevulun Orlev, who has a kippah on his head, sat in the government and enabled the Disengagement while Lieberman, who is completely secular, bowed out in time. So let no one lecture me on values. I do not see how the kippah and religious faith of the elected representatives saved us, because the expulsion was enabled by people with kippot, among others." "I agree completely that in the Likud there is a worrisome phenomenon," she said. "In comes a nationalist person like Tzipi Livni, Ronny Milo or Arik Sharon, and he comes out of there a leftist. And the reason is that their base is [revisionist pioneer Ze'ev] Jabotinsky, whereas our base, my base, is the Bible, and maybe that is the reason for what happened to them." "I am no less Jewish than you, even if I am not religious," she said. Orlev was quick to fire back. "I was shocked by the publication of the blood libel against me by Ayelet Shaked regarding the Disengagement from Gush Katif and if she does not apologize immediately and publicly for the false fact she published, I will file a libel lawsuit against her," he stated. Orlev's spokesman added: "I am sorry to say that participation in the primaries has caused her to lose her mind, and launch a false blood libel that has no basis in reality or foundation in facts." "MK Orlev fought and struggled against the Disengagement, voted against it in all of the votes in the government and the Knesset. After the Knesset decision that supported the Disengagement, Orlev announced his resignation in October 2004, almost a year before the Disengagement." "For Ayelet Shaked's information, no secular minister resigned voluntarily from the government unless they were fired from it: Minister Lieberman before the vote in the government, Minister Landau after he voted against the Disengagement in the Knesset. Minister Netanyahu, who voted in favor of the Disengagement in the Knesset, resigned a few days before the Disengagement was implemented."